Today’s guest is Larry Brooks, whose blog–Storyfix.com–was recently named along with Writer Unboxed as one of the top ten blogs for writers by Write to Done. Larry isn’t only a blogger extraordinaire; he’s an author who’s released a new book on the craft of fiction a few short weeks ago called The Six Core Competencies of Successful Writing. The book–published by Writers Digest Books–soared to the top spot on Amazon in the Fiction Writing Reference category, and remains in the top four books in that category. As curious about the book as we are? Here’s a little Q&A with the author. Q: Why do we need another “how-to” writing book, and how does yours fit in with the others? LB: I think the authors in the top spots at Amazon are successful because they’ve managed to capture a new way of thinking about storytelling rather than rehashing the old 101-level stuff. When writers find something new, their creative juices get recharged. Hope is resurrected, and that sells books. Story Engineering fits in because it offers a totally fresh and empowering way to think about, visualize, plan and execute your stories, and in a way that’s clear and accessible. It’s steroids for writers, in a field in which polite conversation may or may not get you where you want to go. Q: You’ve become known as an evangelist for outlining. Is this an accurate perception? LB: That’s too simplistic, I think. Great stories are not a product of luck or hammering on something until it works. Michelangelo’s first cut at David probably didn’t look like Daffy Duck, it was conceived and executed from the very first hammer blow in context to an understanding of what the end product needs to be. Same with a story. Certain physics – dramatic pressures and pacing – need to be in place. Succinctly defined moments need to happen in specific places. Targeted reader experiences must be elicited. Craft is all about knowing what these basic tenets and principles are, and putting them onto the page in the right place with the very first draft. Not by guessing, or listening to a muse, but by knowing. Once you wrap your head around these basics, the writer has one goal and two choices. The goal is to search for the story’s arc and milestones, in context to a compelling landscape of concept and theme. It may be via an outline, maybe an early draft. Doesn’t matter. Then, once discovered, the story needs to unfold in a certain way. Which means that draft needs to be rewritten from page one. It’s not about outlining, per se. It’s about writing a story in context to an understanding of how a story needs to unfold. Too many writers “pants” (as opposed to plot) because they think they can get away with it, that they’ll stumble upon these non-negotiable criteria. It only works when the writer knows what the list of criteria is all about. Outlining is simply an efficient way to vet creative choices that meet them without doing a whole draft. But a draft can serve that purpose well. You can’t publish and outline, and you can’t publish a draft that was a search tool. Either way, you have to writer your story in context to the big picture that you now own and render to the page. Q: The reviews of your book are pretty enthusiastic. What are people finding here that excites them? LB: Much of the fundamental wisdom about writing is “right-brained” stuff, all soft and mushy and grad-schoolesque. My approach brings the left-brain into the equation (hence the title), by showing people a structure into which they can pour the fluidity of their stories. By giving them criteria, a bar to reach. Without a vessel to hold it, fluids tend to spill all over the place. Q: You write about six core competencies of storytelling. Isn’t the list much longer than that? LB: I like to think of the six core competencies as six buckets of information and criteria. These buckets are deep and wide, and so that list of things we need to study and master as writers, while vast and daunting, at least now has a way to be divided contextually. Anything and everything you can think of about writing an effective story belongs in one of these six buckets. It is when you pour and mix the contents that the real magic happens. Too often writing instruction begins and ends with this homogenized mixture. It’s hard to grasp, like holding water in your hands. My approach breaks the story recipe down into six generic and universal (as in, they always apply) component parts, shows what needs to happen and why, gives criteria for excellence within each, and then shows how they work together with and in context to the other five. If you’re baking a cake and the eggs are rotten, the birthday party will bomb. Same with a story. All six buckets of story ingredients have to be fresh and solid. A sour taste in any one of them will trash the whole thing. Larry Brooks is the bestselling author of five critically-acclaimed novels. 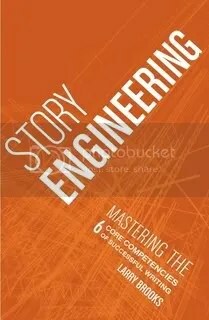 His book, Story Engineering: Mastering the Six Core Competencies of Successful Writing is available online and in bookstores. You can learn more about him at Storyfix.com, or follow him on Twitter. Well, I dunno Larry till date (nor does his storyfix.com).. Thanks for the info WB. Hmm. Although I’ve always outlined to one degree or another, I sometimes wonder if it’s possible to overdo this to the point of not needing to write the novel. My novels actually end up following my outlines very little. Nevertheless, I feel that the outline is a big help in getting me going. It helps give me confidence that I’ll be able to see my idea to THE END. Connie — I don’t disagree. But I hope you didn’t miss my point here — whether outlining or drafting as a means of “searching for story” (which is to say, the post isn’t advocating outlining over drafting), BOTH strategies only stand a chance if the writer has wrapped their head around certain basics, especially structurally. The best prose writer on the planet who doesn’t understand the fundmantals of hook, stakes, set-up and a first plot point (by whatever name you wish to call that critical moment in a story, which happens at a pretty specific place in order to work optimally) won’t find a publisher or an audience, at least until they do. I trust that you do know this stuff, and when you do, a mixture of planning for them (maybe outlining, maybe in your head) and then pantsing your way between them is a great way to go. L.
Great post! I am a big fan of outlining. I think it’s the only way to understand the pacing of my novels. If something isn’t happening where it should, it can kill the progression of the story. It’s much easier to catch that in outline than in a draft, I think. Connie, I have a writer friend who says exactly that. She tried outlining once and then didn’t want to write the story because she knows how it ends. But, every time she writes a new book, she struggles to find the end of the story. I’m the opposite – pantsing a story gives me the willies. When I started writing seriously, I pantsed and kept running out of story at 35,000 words. My observation is that post plotters will avoid at least 1 revision pass because their story is always moving forward. The pantser will need to clean up the wandering scenes in revision. Connie – hate to break it to your friend, but this isn’t really a choice or a preference. You can’t write a successful draft if you don’t know how it will end. Unless you are a highly experienced pro or a prodigy, it just can’t and won’t happen. For a draft to be optimally effective, it needs to be written IN CONTEXT TO how it will end. if the writer starts a draft without knowing the ending, then that draft is part of the search for story. Once they discover a great ending, then and only then can the draft be rewritten with it as context. The great mistake of unpublished pantsers who do this is that they think their suddenly focused draft (without an ending it is, by definition, unfocused until the moment the writer comes up with a vision for the ending) is still viable. Stephen King’s novels, which happen this way, are larely unreadable due to rambling all over the map in search of an ending. The rest of us can’t get away with adopting that approach. When I started writing my novel, I knew what would happen in the middle and how it would end. But I didn’t know how the main character would get there; she found her way as I was writing. I’m not sure if that qualifies as outlining, or maybe I’m doing a bit of both outlining and pants? Larry, Perry and others. I think you have to find a balance and that balance is different for each of us. In fact it may vary over time for the same author. I always need some outlining and prefer to know where I’m going with my writing, at least somewhat, and that I can reach a satisfactory conclusion, at least in my own mind. But at times I’ve spent months outlining and revising the outline and for other novels I may spend a few weeks outlining (after daydreaming about the novel for months prior to that). In all, it sounds like a fascinating read Larry. Connie — I agree… with both of your posts. This issue seems to be a hot button, as soon as some pantsers (especially) hear the word outline they throw up red flags. Balance is key, and on one end of the balancing scales is the absolutely need to create a story that adheres to the fundamentals of dramatic theory and the expected (by publishers and readers) story structure. How we get there, that’s our choice. Outlining or pantsing… either way you go, you end up doing some of both. After rereading a couple of the posts above, somehow I think we’re all saying basically the same thing. Writing my first novel, I used a combination of the two methods. I started writing the story and go as far as I can. But the minute I got stuck, I started outlining the next chapter or two. I found that switching to the outline mode served two purposes. 1) It helped me define goals for each chapter. When I knew where the next chapter was going to start, I could figure out what had to happen in the current chapter. 2) It helped me maintain my writing momentum. Even on days where I wrote only a few paragraphs of the draft, I knew I had worked out at least a few details of plot or character on which I could build more. Just got your book and there are some real gems in there. I’m also taking a class about learning styles and it’s now clear to me the reason I’m a pantser is because I have a Kinesthetic approach to learning. So I’ll probably always have to write draft after draft because that’s how I learn – by experiencing the story. More work for me but that’s the way I do things… but I always write the first scene and then the last scene (sometimes last comes first) and then fill in the blanks in-between as the scenes come to me. I’m with you on the principle of outlining and understanding the conclusion of your story before you start. I think of novel writing like a journey, you need to know where you want to end up. The only thing is that in novel writing we don’t have to start off from our house, we can start anywhere. Outlining (plot and characters) allows me to see which of many starting points and routes will be the most interesting – without having to write 50k to find out! I guess I’m biased to start with since I’m an engineer. But no-one starts an engineering project with establishing the requirements, design, analyses etc before they cut metal, solder chips or write software. I’ve had a B&N card for a while, so now I have a reason to spend it! Thank you, Larry and the always awesome Writer Unboxed, for this post. It’s always interesting, the debate between pantsing and planning among novelists. I do think depending on our learning styles and thought processes that there is a difference for each of us on how we most effectively write a long project like a novel. I look forward to picking up your book. And thank you for the post. I’ll be checking out storyfix, too.